So this is my last project as a TGF Farm Fresh Challenge DT member. I am so sad. The last six months have flown by and I am so blessed to have gotten to know the fab ladies on my team - Jess, Lisa, Margie, Sharette, and Joni. Be sure to drop by their blogs and give them some love. This week, we are CASEing one of our fearless team captain's cards...Margie Cortina. I chose her card posted on SCS and using the newest Creeper Crew - Madden. The card base is Very Vanilla with layers of blue sky and Chatter Box's Gazebo papers. The punch is EK Success spiral notebook. The embossed card is the Cuttlebug library card. The image is TGF's new Sitting Casual colored in copic and mounted with dimensionals. The sentiment is also from the new set and mounted on dimensionals. The brads are from Michael's bright brads. This is my entry for TGF's March Madness week 3 - Tea Party. I decided to do a "Alice in Wonderland" SMASH page, featuring my favorite quote from the girl herself. "If I listened earlier, I wouldn't be here. But that's the trouble with me. I give myself very good advice, but I seldom follow it." I used some black Bazzill with Bazzill basic newsprint and vintage ads. I ripped and folded them to add some texture and dimension. I wanted a mix of black and white and color to draw focus to specific images of the design, as well as highlight the brilliant colors of Wonderland. The images are from TGF's Wonderland digis - Alice, mushroom, and the Hatter's hat and the clear mount Tea-rrific set for the cups and Love tag. I cut little tags with the "eat me" and "drink me". They are added with some jute twine and mini safety pins. Monday Funday #26 - Anything Goes! This is my last challenge as a TGF Farm Fresh Design Team member...I can't believe how fast the last six months have gone by. I want to take a moment to thank Marie and Jess for the opportunity and the fun. Jess believed in me when I was less than confident I could take on the weekly obligation during a fairly turbulent time in my life. Thanks, Jess, for all your support! You and our fearless team captain, Margie, have been real sanity savers. This week is Anything Goes! 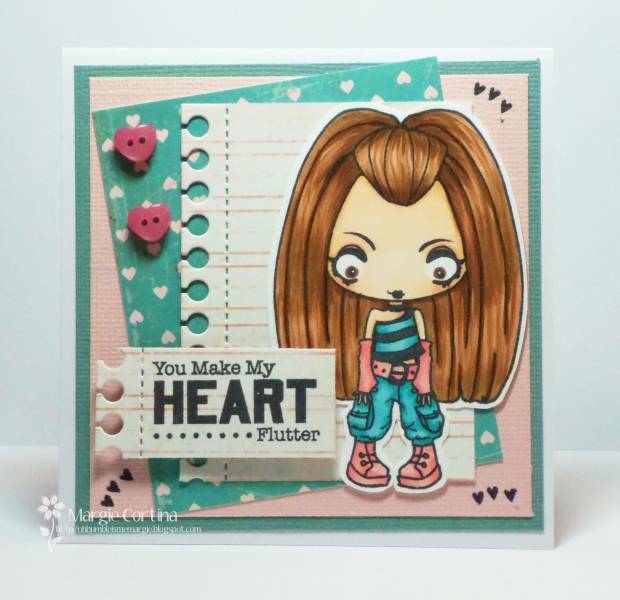 My card base is Pool Party that is embossed with the distressed diamonds Cuttlebug folder. The grass is Pear Pizzaz that is snipped with scissors. I free hand cut the tree and clouds. The sun is punched with a 1 1/4" circle, embossed with the circles folder. The clouds are embossed with the Swiss Dots folder. I used a fine liner to to make grain in the bark. The swing is the seat from the new TGF Sitting Lovely wood bench. I used jute twine for the rope. The image is from TGF's Sitting Cute, colored in copic, and mounted with dimensionals. The sentiment is stamped from the TGF Special Autumn set. I wanted lots of texture but keeping it flat for mailing. This weeks TGF Farm Fresh Monday Funday challenge is: circles & scallops. I based this week's card on the Saturday Sketch challenge posted at TGF's SCS forum. This week's sketch is #8. The card base is Whisper White with layers of lilac, turquoise, and a scrap of sky paper. The clouds and wavy border are Whisper White. I free hand cut the clouds before embossing them with the large polka dots cuttlebug embossing folder. The waves are made with the EK Success bubble border punch, then punched with the SU scalloped border punch. I think it gives a fun foamy effect. The ocean water is made by punching circles ranging from 1/8" to 3/4" from vellum, gluing to the turquoise, then embossing with the devine swirls embossing folder. The image is TGF's Mermaid Anya and is colored with copic markers, then mounted with dimensionals. I added a few highlights on her with the Sakura stardust clear gel pen and the Spica clear pen. The finishing touches are a small white bow in the clouds, clear skittle bubbles in the water, and pearls in Anya's hair. Can you believe the last six months have flown by and this is my last Retro-Fresh challenge as a TGF Farm Fresh Challenge DT member? I can hardly believe it. This month's theme is "Spring Cleaning". I am also entering this in Anyone For Anya's pirate challenge. So we are supposed to pull out something we have never used or rare get a chance to show some love to. My choice is my Karen Foster pirate paper, the coordinating stickers, and my new dark red sealing wax with the key seal. The base is burgundy with layers of two of KF pirate paper. The image is TGF's Matey Ian colored in copic markers and mounted on dimensionals. The tag is Tim Holtz journalling ticket that I wrapped with some scrap jute twine because it reminds me of rope. To tack it in place, it is taped on the back, then I used the wax to puddle over top, then sealed it with the key. It sort of reminds me of the one from Pirates of the Caribbean: Dead Man's Chest. The sticker is one I have been dying to use, but never found a good use for, until now. I used some Tim Holtz tiny attachers on the corners to finish the look. It's time for a Black and White challenge at TGF's Farm Fresh Challenge blog. This week, I used some new stuff I have been dying to play with before packing it up for our move to a new state. The base is Whisper White with layers of Basic Black. The inner white layer is stamped with TGF Splotchy backgrounds in Dove Gray Staz-On and Tim Holtz Burlap distress ink. I ripped the bottom edge for some texture and used the Tim Holtz distressing tool around the other three edges. Next is a safety pin in opposite corners and Tim Holtz tiny attacher staples on the remaining corners. The black music notes background is from DCWV Preformance mat stack and is punched with the drippy goo border punch from Martha Stewart. The skull and bones chipboard is from a Basic Grey halloween chipboard bucket and comes pre-embossed with black glitter. The image is TGF's Sweet & Toxic and stamped in Jet Black Staz-On on Whisper White and Whisper White craft ink on Basic Black for a fun two-toned effect and mounted on thick dimensionals. The sentiment is from Michael's dollar bin stamped in Jet Black on Whisper White. It is punched with a 1 3/4" circle punch, embellished with a mini safety pin, and mounted on a dimensional. My time as a TGF Farm Fresh Challenge DT member is winding down. It is bittersweet. I have been in the midst of a multi-state move, so it is a challenge to get the cards done and pack/unpack. This has been an amazing opportunity and Jess and the girls have helped me keep my sanity through it all...so a huge thank you to them for all their support. Also, a huge thanks for all the supportive and fab comments from my followers...you have made my day! This week's challenge is Fairytale Inspired. No princesses for this girl! I picked Goldilocks and the Three Bears. This is my first accordian card. It isn't perfect but I did think it turned out rather cute. The base is Chocolate Chip with layers of Provocraft sky paper, pine green, kraft, and Summer Sun. I inked the sky paper in Pool Party ink before freehand cutting a hill and using the EK Success pine tree border punch for the little trees. The green layers are inked in Lucky Limeade. The grassy paper in the foreground is Provocraft grass print. I used scraps of craft to make it look like a dirt path. It is inked in CTMH's Brown Bag. The images are from TGF's Miss Anya Lounge and Toby digi. They are both colored in copic markers and Miss Anya is mounted with dimensionals. The "sun" is stamped in Summer Sun in Timber Brown Staz-On using TGF's retired "Hello Go Round" and punched and layered with a circle and scallop circle punches.